Whether you have a glitter tattoo at a small party or at a booth at a big festival Ybody, with over 15 years in the business, has organized for you a checklist of what to bring with you. Click each item to read further. Thinks to take into consideration when planning what to bring is the number of hours of working and number of workers assisting you in the job. This will affect the number of products to bring as explained below. Click here for a printout of the checklist to fill out as you prepare for your gig. The rule of thumb is one 15ml glue bottle per 80 – 100 stencils depending on your thickness, although a thin layer of glue is preferable. We recommend using only glue which has some sort of approval from the Ministry of Health. Ybody’s world famous Pink Glue is FDA Registered and lasts 3-10 days. You may want to download and frame the FDA Registration and keep it on your table as a sign of reliability. 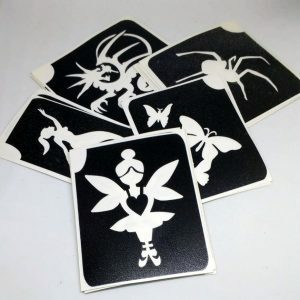 Stencil Quality – Stencils are the heart of the operation and therefore should be of good quality – not all stencils are created equal. Henna stencils have the fine lines break away. Stencils glue should be strong enough to stay on the body even during difficult conditions yet skin safe. Stencil Quantity – 20 stencils per hour per worker. 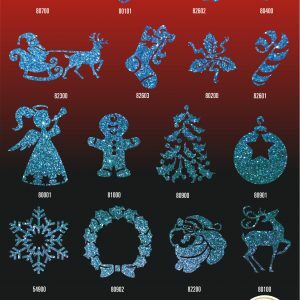 This also depends on the size of the stencils number of glitter colors used in the tattoos. For hygienic reasons, we do not recommend using the same stencil twice. 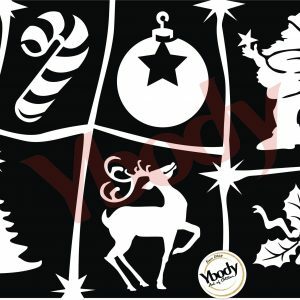 Stencil Selection – You should have a selection of samples of stencils, appropriate to the event you are attending and known best sellers. Stencil Storage – It is possible to place the stencils in a small photo album, or in a box with dividers, or in an accordion-style folder. 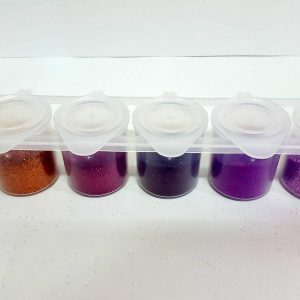 Professionals are advised to work with glitter containers that are easy to open and close and will not spill easily. Ybody’s famous 6-pack-racks with six coordinating colors help the customer see the colors and easily pick, while the similar color families promises a beautiful finish. The full rack is enough for around 650 stencils. Easy to pack and go. Other professionals prefer the squeeze-bottles for it’s brush free application. It is important to use skin-safe glitter. Store bought glitter is often unevenly cut with sharp edges. 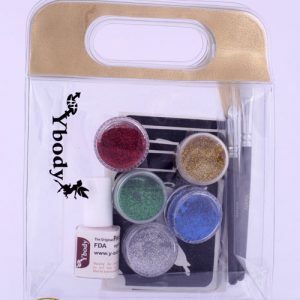 Ybody’s high-quality glitter is 0.008″ extra fine grained and offers a more professional affect to the final tattoo. 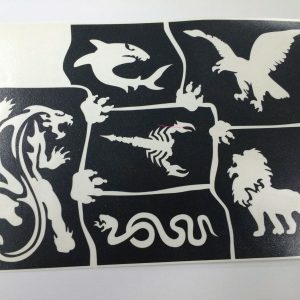 A promotional display that shows your tattoo selection is a fantastic tool that will assist your customers’ in picking their stencils and to prevent customers from handling the stencils, thus reducing wear and tear. A Roll-Up Banner drives traffic to your booth by attracting customers from afar and with a help of a co-worker, will cause excitement around your booth (check out a Tip of the Trade). Homemade presentations using cork boards to pin up the stencils is also an option although can be a bit messy and less professional. Ybody offers a variety of display options. For smaller events the A4 Theme Posters or A3 Posters allows the customer to pick from either 16 or 33 possible designs. While for larger events the roll up banner with 150 best selling designs is a great promotional tool. All come with accompanying stencil sets. Before applying the glitter tattoos, clean the skin area well using wet wipes in order to remove possible body cream, sweat or dirt before placing the stencils. Wipes can also be used to remove misapplied body glue before it dries if necessary. Essential body oils can be used for removing glitter tattoos. Just apply a few drops directly onto the tattoo. Using your fingers rub gently until you see the tattoo dissolving. Finish off with a wet wipe or towel. Although most Ybody stencils were created for a smooth removal, sometimes there are small details that need to be removed separately. It is easier to remove them with tweezers rather than with fingernails in order not to damage the glitter tattoo or hurt the customer. Often customers inquiry about the safety of your materials. Having a folder with all your product certifications such as FDA Registration and Material Safety Data Sheets (MSDS) is a smart move when questioned by the customer. 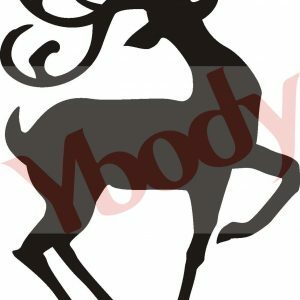 For Ybody products you can download and print the product certifications here. Yes, it’s obvious, you need somewhere to collect the remains of the stencils and the wipes. Otherwise you will have a messy, unsightly stall, which will be less inviting to customers. An open plastic bag within a small box is an option. The more prepared you are for the stall, the more the money will flow – one of the ways is to be prepared is with a wide range of change options. This way you won’t cause discomfort to the customer, make them wait, or leave the stand unattended while looking for someone with whom to exchange money. Satisfied customers will be happy to invite you to events that they are organizing – a business card is a smart way to get other glitter tattoo jobs. Think positively, smile, be generous and kind – this energy will cause your stall to prosper. Summer offers endless possibilities for glitter tattoo operators. Take the initiative and contact your local pools and malls to see if you can open a stand. Check with your local municipality if there are special summer events planned such as street / block parties, county fairs, or end of summer events and reserve a booth. A little creativity can provide you with an extra income and publicity. Wherever you work, be prepared with the glitter tattoo checklist. Have a tip or something you think should be added to the list? Please comment below.